Kids, come on down to our Reading Circle. 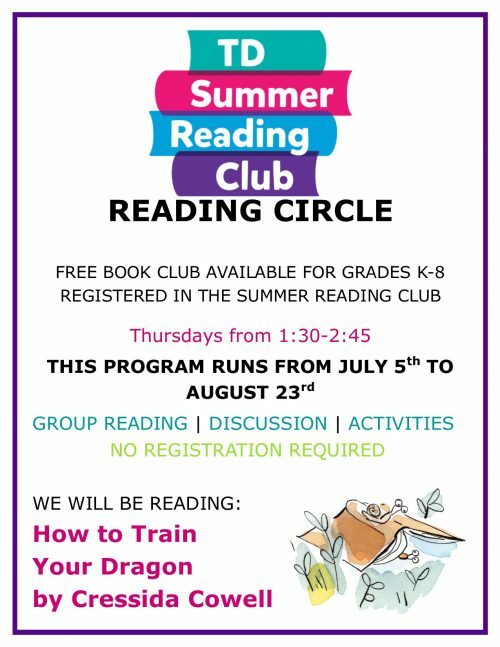 Reading Circle is our children’s book club where we read 1-2 chapters of a book and discuss it, every week over the course of the summer. There is also a craft or game involved with the book material as well. This is a drop-in program. No need to sign up. Parents, just sign your kids in when you drop them off! For grades Kindergarten and up. If you haven’t attended before, no worries. We’ll catch you up to what’s happening in the book. This program runs until August 23rd, on which day, we will be watching the movie adaptation together as a class!